Wireless headphones come in many shapes and sizes but few offer better home theater performance than the RS 170. 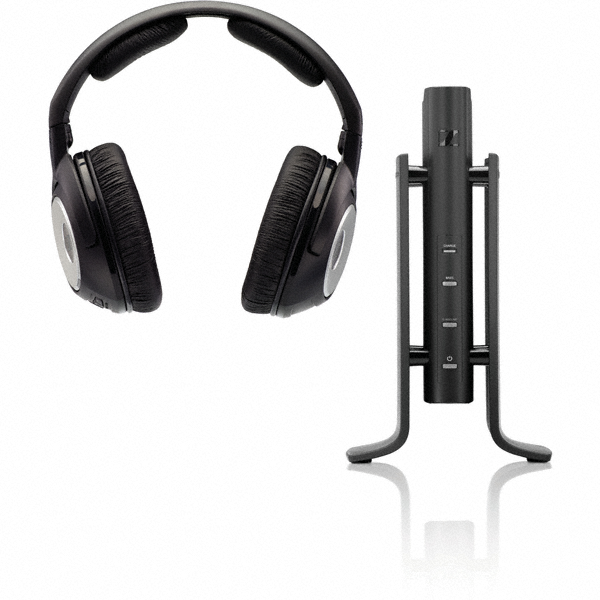 This wireless headphone system is made up of a pair of wireless headphones (HDR 170) and a multi-purpose transmitter (TX 170) which also functions as an ´easy-charge´ cradle and docking station. The RS 170 also features a Dynamic Bass Boost and Surround Sound simulation mode for edge-of-your-seat excitement with your favorite music and movies! The RS 170 utilizes KLEER´s lossless digital wireless audio transmission (it sounds wired! ), offering a range of up to 260 feet, audiophile-grade sound and reception to four optional pairs of Sennheiser KLEER headphones. Never fuss with tuning again thanks to automatic, interference-free pairing between the headphone and transmitter. An exceptionally detailed, full-bodied sound reproduction is pumped into the listeners ears, filling the sealed, private earcups with liquid smooth audio. The headphones´ leatherette earpads and headband cushions deliver outstanding comfort while their closed, around-the-ear design prevents sound leakage. In a high-definition age, this one is a must-have. "The RS 170 wireless headphones allow me to move around effortlessly and have been great for the Actors on the TV series Bones on Fox. The sound quality is quite amazing considering how reasonably priced the RS 170 is." -Rob Nokes, CEO, Sounddogs.com & Supervising Sound Editor, "Bones"
*note* while the sound quaity of these headphones is fantastic for any type of music, they were not designed for use while recording/tracking and monitoring or musical instrument practice (performer wears the headphones while playing).